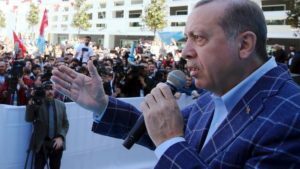 There were, by the end of March 2017, growing indications that Turkish President Reçep Tayyip Erdoğan had concrete plans to unleash a new wave of undocumented migrants into the European Union if he failed to win the absolute power he was seeking in the April 16, 2017, constitutional amendment referendum in Turkey. There also existed the strong prospect that he would orchestrate a new flow of undocumented migrants into the EU, even if he did win the vote, given the reality that his campaign to win absolute power — a campaign which included staging the “false coup” of July 2016 — had seemed to irreversibly alienate EU member states from Turkey. There was now little chance that Turkey would win EU membership (or that the Turkish President was still seeking it), and there was growing hostility toward Turkey’s continued membership in the North Atlantic Treaty Organization (NATO). The only moderating element was that President Erdoğan sought to retain Turkish membership in NATO. The referendum of April 16, 2017, proposed a set of 18 amendments to the Constitution of Turkey, advocated by the governing Justice and Development Party (AKP). The proposed amendments included introducing an executive presidency to replace the parliamentary system of government and abolishing the position of Prime Minister as head-of-government. Proposed amendments included raising of the number of seats in Grand National Assembly from 550 to 600 and changes in the Supreme Board of Judges and Prosecutors (HSYK). Success for the AKP in the referendum would compound the growing Brussels-Ankara alienation, particularly at a time when President Erdoğan’s relationship with his principal EU ally, German Chancellor Angela Merkel has been severed, and Chancellor Merkel had begun (as of Nov. 27, 2016) attempting to repatriate, in 2017, some 100,000 of the estimated 1.2-million refugees from President Erdoğan’s earlier campaign against the EU in 2015. Mrs Merkel said that about one-third of those expelled in 2017 would probably be evicted against their will. Not all came from the Syria conflict zone, but even those from Iraq, Afghanistan, Eritrea, and sub-Saharan Africa via Libya, were mostly facilitated by migrant smugglers working with the Turkish intelligence service, MIT. President Erdoğan’s advisors now appear to have indicated that the threat of unleashing into the EU and the Balkans new waves of refugees from the war which Turkey began in Syria could probably not be used effectively at this time to blackmail Germany and other EU states into sending funds to Turkey. President Erdoğan’s two major remaining allies in the West — the U.S. and UK — were unlikely to help Turkey financially, and his hope that the U.S. would revitalize its ties with Turkey were dashed with the dismissal by U.S. President Donald Trump of his pro-Ankara National Security Advisor, Lt.-Gen. Michael Flynn, on Feb. 14, 2017. And even though UK Prime Minister Theresa May, meeting with President Erdoğan in Ankara on Jan. 28, 2017, resulted in an agreement by UK company BAE to work with Turkish Aerospace Industries (TAI) on a new fighter project, and a vague commitment to increase bilateral trade to $20-billion a year, the reality remained that the UK’s willingness and ability to stand by Turkey — particularly as it radicalized — was unlikely to hold. One of the remaining links between Washington and Ankara has remained the U.S./NATO use of Turkey’s Incirlik Air Base, for operations against DI’ISH (Islamic State) in Syria and Turkey. However, Ankara has consistently circumscribed U.S. use of Incirlik, particularly since the pseudo-coup of July 15-16, 2017. Germany’s use of Incirlik, by the Luftwaffe, for counter-DI’ISH operations, was, by early 2017, being viewed by Berlin as unsustainable. By March 12, 2017, German parliamentarians, including those from Chancellor Merkel’s own CDU-CSU coalition, repeated their call for an end to German use of Incirlik, which hosted some 240 personnel and Panavia Tornado strike aircraft. On March 29, 2017, the German Government revealed that it had already surveyed alternate sites for German Middle Eastern deployments to replace Incirlik. These included three sites each in Kuwait and Jordan, and two in Cyprus (Akrotiri and Paphos). It was understood, too, that the U.S. had also conducted site surveys for alternate locations for its Middle Eastern deployments in the event that Incirlik proved no longer viable. The U.S. Defense Dept., however, was reluctant to “walk away” from its Incirlik basing, despite the increasing difficulties in using it (although the U.S. had been progressively removing nuclear weapons from the base), knowing that a final push of Turkey out of NATO could possibly result in a Russian use of the facility. Turkey had already, in early 2017, floated the idea of acquiring Russian S-400 Triumf (NATO reporting name SA-21 Growler) air defense system. It had already scrapped a $3.4-billion deal with the People’s Republic of China (PRC) in 2013, to buy a PRC system, when the U.S. and other NATO states objected. The 2017 threat of a Turkish S-400 buy, knowing the NATO response to the 2013 PRC project, seemed designed to force NATO/U.S. concessions to Ankara at a time when the April referendum was likely to cause NATO, the EU, and the U.S. to reconsider their relationships with Turkey. Given the growing and widespread dissatisfaction within the U.S. political establishment with Turkey, it was clear that the U.S. Defense Dept. recognized that it was necessary to make contingency plans for the probability that Turkey would either be forced from NATO, or the U.S. would be forced to unilaterally sever ties. But the reality would go well beyond the use of Incirlik, and would impact the myriad of defense supply agreements which the U.S. had with Turkey. Unraveling those relationships, and cauterizing the security links on sensitive technologies accompanying them, was an issue of such magnitude that Pentagon officials were reluctant to broach them. Moreover, inspired leaks from Ankara in recent months have made it clear that Turkey would — if freed from the constraints of NATO membership — move ahead with its nuclear weapons program and other WMD projects (including chemical and biological weapons and ballistic delivery systems). As well, U.S. policymakers have long believed that walking away from Turkey, despite seemingly irreconcilable differences between the current Turkish Government and the U.S., would be tantamount to giving Russia a major regional strategic advantage. President Erdoğan has been relying on this to allow him to continue his seeming risk-taking. And Ankara needed this “threat of unacceptable consequences” to curb any violent reaction by Washington, Brussels, or London because there was little doubt that President Erdoğan needed some Western leverage — such as NATO membership — to keep him from being totally subject to pressures from Russia. Moreover, Russian ties with neighboring (and rival) Iran caused Ankara to seek to keep its options open with the West, even though the growing consolidation of the neo-Ottoman and Islamist positions of the Erdoğan Government were testing Turkish relations with the West to the utmost. The reality that Turkey’s supposed “special relationship” with Washington were under stress was reinforced by the arrest, on March 29, 2017, of a senior official, based in New York, of Turkey’s second-largest bank, Halkbank. Its vice-president for international banking, Mehmet Hakan Atilla, was arrested for violating the U.S. sanctions against Iran. On the orders of the acting U.S. attorney for the Southern District of New York, Joon H. Kim, FBI agents arrested Atilla for participating “in a years- long scheme to violate American sanctions laws by helping Reza Zarrab, a major gold trader, use U.S. financial institutions to engage in prohibited financial transactions that illegally funneled millions of dollars to Iran”. The arrest was clearly approved at the highest levels of the U.S. Trump Administration, and sent a pointed signal to both Turkey and Iran. External opposition to President Erdoğan had the effect of solidifying the backing of his supporters leading up to the referendum, despite the reality that his policies have led to a major structural weakening of the Turkish economy [the GDP declined from $823-243-billion in 2013 to $718.221-billion in 2015, and the major impact of Turkey’s economic isolation was, by the end of March 2017, still waiting to be felt]. The President was expected to accelerate his blame of external forces (particularly the EU) for Turkey’s coming economic collapse — which would further enable his consolidation of power — so that he could push Turkey onto a wartime footing. Despite the fact that the Turkish opposition to the referendum was significant, the steps which President Erdoğan had taken in recent years, including the staging of the false coup in July 2016 which enabled him to suppress almost all opposition, have ensured that he was likely to win the April 2017 referendum. This would have major consequences for NATO, Europe, Russia, Iran, and the Mashreq, as well as for areas of the Red Sea/Horn of Africa and the Maghreb and Sub-Saharan Africa where Turkey has been actively projecting power in recent years. There is little evidence that NATO states, in particular, have prepared for the consequences.